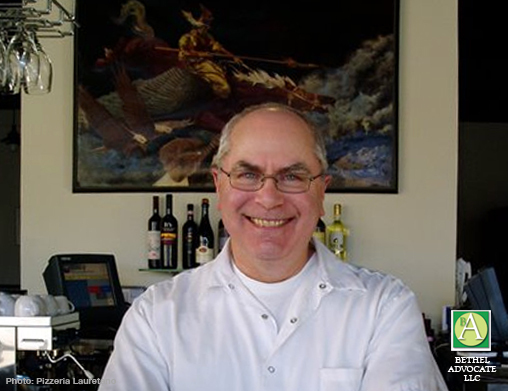 Photo: Pizzeria Lauretano Proprietor Michael Lauretano. Bethel’s Pizzeria Lauretano recently announced they are now permanently closed. “After 12 years, we are closing Pizzeria Lauretano with our last day in operation Saturday, August 19. “It has been a tremendous experience for me, a major chapter in my life that I fully enjoyed. I think of myself as an unlikely proprietor but I managed to get into all aspects of the business to such a degree that it became my life and I found the reality of it just amazing. “So many wonderful people have passed through this experience over the years, it took on the aspect of theater with everyone playing their parts perfectly. “I love working in the kitchen and I love the kitchen crew. I’m in awe of the serving staff that took control and responsibility freeing me up to take care of office business, not my favorite thing, but necessary. “So many customers went out of their way to express their appreciation for what we do, I was constantly reassured in spite of the ups and downs of business. “The most fun for me was working with Manuel at the pizza oven on a busy Sunday night with all the house tuned in to the sounds of live jazz. Jazz at the pizzeria is something I’m absolutely proud of. What great collaboration and dedication all around. And we sustained it for years as it just got better and better.